David asked recently about signatures: "Would you care to comment on placement of a signature/choosing a color for the signature." David, I would and I will. My opinion is to choose an out of the way location (a bottom corner is traditional but not necessary) and a color that doesn't overwhelm the painting. I generally use gray - something with enough contrast to the color it will go on - usually dark because that seems to draw less attention. Someone told me once they'd found a painting they just loved but didn't buy it because the signature was too "loud." That convinced me. Hi Carol, Love your paintings. I usually sign my paintings only on the back. HI - any thoughts on dating the painting too? Someone told me I should and I read something someplace else suggesting it too - not convinced all that information along w/signature belongs on the front or not? We should all develop a confident signature. Your joined initials are discreet but are more than a squiggle because they are bracketed by two dashes. My signature has first, middle and last names - all with the same amount of letters- and I stack them in a cube. But if I think it's too complicated (on a small of very simple composition) I shorten it to my initials or last name. Sometimes I paint it or use pencil; but I never use ball-point pen. 'Nuf of that. I like the reflected blue light bouncing onto the pears. If you cut a pear (or apple) across its stem you get a little star; free gift with purchase! What a keen sense of composition you have Carol. My eyes were led all over the canvas. And thank you David and Carol for your thoughts on signatures. I've wiped/sanded the board clean because my initials were too distracting. I agree, less is more. Simply amazing. You're the best! Solid! 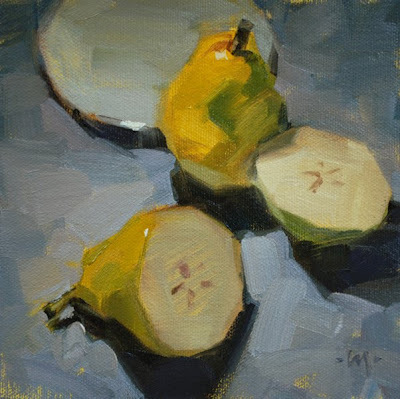 Enjoy how those few broad- dashed gray strokes between the two cut pear halves really help reinforce the ambiguity between illusory space and picture surface. I agree with the person who mentioned the "loud" signature. I am pleased to have signatures on the front of work I purchase, but it should be there when looked for, rather than being the second or third (or even fifth) thing I see when I look at the work.